You could say surveying is in his blood. Dan Marti, PLS, Schemmer's Survey Manager, is a third generation professional land surveyor and started working in the field when he was just 13-years-old. His mom was a Land Surveyor in training and his grandpa and uncle were both licensed Land Surveyors. Growing up in Iowa, Dan worked for his mom and grandpa as a Rodman at H&S Surveying in the small town of Eldridge. This is where his love of survey work was born. His favorite parts of the job? Simple, "It is physical and mental. You get to work outdoors and indoors. You have a variety of places you go and things you do," said Dan. Dan, his wife and four children moved to Nebraska after he accepted a job at Schemmer in June of 2017. 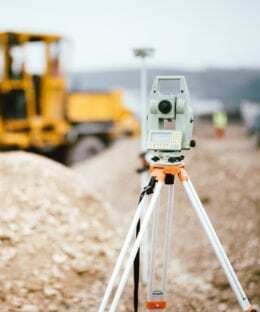 By this time, he had nearly 16 years of managing experience under his belt as a Professional Land Surveyor, including 12 years working on projects for the Iowa and Illinois Departments of Transportation. For Schemmer, Dan manages survey services for our Nebraska and Iowa projects. "Managing a survey group is exciting and challenging. Reviewing surveys and working with others in the group to accomplish survey-related projects is very rewarding." Dan is proud to work at a company that truly follows through with putting the focus on its clients. He believes that Schemmer delivers a level of commitment that separates us from the rest. Schemmer continues to study and implement renewable energies when possible. If energy costs rise or regulations require lower consumption, we’ll be ready. It is our responsibility to identify where we can help clients save energy, conserve the natural environment and look for sustainable solutions.